Many people find that early morning is the most productive time to do their tasks. If you are up and moving before most other people, you will be motivated to accomplish more. Be clear about what you want to achieve each day. Have all your tools readily at hand. Make sure you have a comfortable chair that supports your back. Also, keep your desk tidy to control stress and help maintain productivity. Start the day by tackling the most important tasks first. Try to focus on one task at a time because it will help you complete it with the highest standard. Surround yourself with things you have done: diplomas, certificates and other reminders of your success. Your limitations in output may come from limitations in your skill level. So, don't hesitate to take continuing education courses that will increase your knowledge. Time pockets are short bits of time that you have in between one event and the next. It could be waiting for a bus or an appointment. Take that time to get something accomplished. Set specific goals and track your progress so you know how you are doing. Also, set a specific goal to complete certain tasks within fixed time slots. Every week take time to chart your accomplishments. 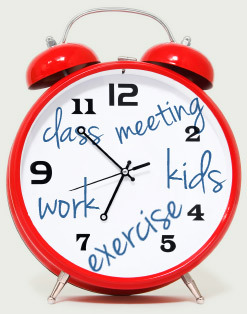 Let others in your household know when you're working and are not to be bothered. Take steps to avoid such distractions as cell phones, text messaging, email, social media sites and TV. If you have a laptop, take it to a coffee shop or the library or anywhere you can get good work done in a productive atmosphere. Make sure to take time to be active throughout the day, whether it's a brisk morning walk or a trip to the gym. It's about the quality of work produced, not the quantity of hours spent. So, take time to do the things you enjoy on a set schedule and reward yourself for a productive day.